Two stories today that I suspect we’ve all heard many times – the story of Zacchaeus, and the parable of the talents. Before we get into the stories, though, I’d like to ask you to hold a thought in the back of your mind: in the story of Zacchaeus we read that Zacchaeus had to climb a tree to see Jesus because he was a short man. But there is no indication in the language to tell us which of the two men – Zacchaeus or Jesus – was short. Either would make perfect linguistic and logical sense. But we always tell the story with Zacchaeus being the short man. Just hold that in the back of your mind. But today we bring these two stories together – for I believe that one thing that Zacchaeus does for us is to give us insight into what is one of Jesus’ more troubling parables. Now I’m guessing that you’ve heard this parable before, and if the sermons you’ve heard have been anything like the ones I’ve heard they will have dwelt on the basic moral: use the gifts that you’ve been given for the good of the Kingdom of God. I’m also guessing that the king’s words “to all those who have, more will be given; but from those who have nothing, even what they have will be taken away” have been left a little bit hanging; perhaps rather unconvincingly interpreted, perhaps omitted entirely. And as for the sentence after that, “as for these enemies of mine who did not want me to be king over them—bring them here and slaughter them in my presence”, I wonder if you even recognised it as part of the story. I’ve certainly never heard a preacher speak on that part of the text. Which is a shame, really. Because the fact that those parts of the story really don’t seem to fit perhaps ought to cause us to wonder whether we have got the story completely the wrong way around. Why, I wonder, do we identify the nobleman in the story with Jesus, or with God? Why do we place him on side of the angels? Look at the how the nobleman is described: he starts off ‘going to a distant country to get royal power for himself’, and he ends up publically slaughtering all those who refuse to have him as their king. In between he is accused – and seems to accept, and live up to, the accusation – of being a harsh man, taking what he doesn’t deposit, reaping what he doesn’t sow. He tells his servant that he ought to have put the money in the bank to earn interest, even though lending money for interest was forbidden in the law of Moses, and he declares that those who have nothing will have even what they have taken away from them. Does any of that actually sound the remotest bit like Jesus is talking about himself to you? Doesn’t it sound a lot more like a description of the way that the kings of the world behave than the ways of the Kingdom of God? In fact, what those difficult words “from those who have nothing, even what they have will be taken away” reminded me of were the story the prophet Nathan told to King David. In that story the prophet tells of a poor man who has just one possession, a baby kid; and a wealthy man who, when a visitor arrives, takes the kid from the poor man to entertain his guest. “From those who have nothing, even what they have will be taken away”. David condemns the wealthy man, only then discover that he is condemning himself. David’s fault in that story is that he has begun to behave in the way that the kings of the world behave, not the way that God’s people are called to behave. Now go back to the context of the story: Jesus told it, Luke says, “because he was near Jerusalem, and because they supposed that the kingdom of God was to appear”. They were drawing near to the centre of power, and the people were expecting the arrival of the Kingdom. And Jesus tells a story which is all about what happens, in the human way of things, when someone decides that they should be made king. This isn’t a story in which the nobleman, seeking royal power, is a allegory of Jesus. It’s exactly the opposite. It’s a story all about how completely broken the human way of operating is, of all that goes wrong, of the way that greed and the quest for power lead to increased injustice and violence: and of why no-one should expect Jesus’ kingdom, or kingship, to look anything like the kingdoms they are used to. Why the Kingdom of God is, in so many ways, an upside down version of all the other kingdoms of the world. Which brings us, back to the placement of this story immediately the very well known story of Zacchaeus. “As they were listening,” to Jesus’ encounter with Zacchaeus, “he went on tell them this parable”. Because what has just happened with Zacchaeus is exactly the change in mindset, the change in approach, that Jesus is pointing to. For Zacchaeus’ life has been a spectacular success in the way of the world. He isn’t just a tax-collector, he’s the chief tax-collector; he has others working for him, he’s skimming the cream off their profits at the expense of his fellow Jews. In fact, he’s done exactly what the first servant in the parable has done – taken his position as a servant of the empire, and used it to make a considerable profit both for himself and for the king. If the Roman governor of the day had paid a visit, Zacchaeus would have received his praise: “well done, good and faithful servant!”. But instead, he receives a visit from a very different sort of King. And encountering Jesus, Zacchaeus suddenly gets it. His work for the kings of the world, his loyal service to them and to himself, is rendered meaningless. All the rewards he had earned for himself, all the praise of rulers and trappings of empire, were nothing compared to what he had lost. There are lots of sermons in the story of Zacchaeus, lots we can learn about discipleship from his encounter with Jesus. There’s a whole load of stuff around the character and personality of Zacchaeus – his enthusiasm to see Jesus, his willingness to do something a bit out of the ordinary; Jesus’ recognition of the longing for change in the heart of a man that had been written off as a sinner and a collaborator by the masses; Zacchaeus’ understanding of the need for genuine change in response to the grace of God shown to him in Jesus’ greeting. Then there’s the fact that Jesus’ willingness to welcome the outsider, the reject, was not just for those who had, as it were, been pushed out of the bottom of society – the leper, the foreigner, women, children – but also was available for those, like Zacchaeus, who had effectively excluded themselves at the top of the ladder, who had gained the whole world but lost their soul in doing so. But for me the story of Zacchaeus is most of all about value, and about what matters. About how we identify winners and losers, the valuable and the pitiful. About the way we read the parable of the talents and simply assume that the man who gets the most rewards at the end is the winner. About why we assume Zacchaeus was short, not Jesus. Learning from the disciples involves learning about what people who came into contact with Jesus came to value, came to care about. 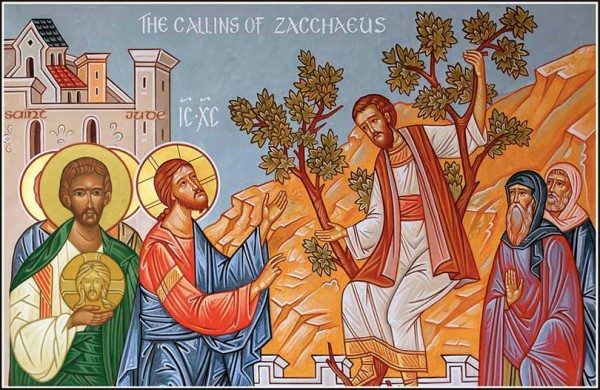 Zacchaeus teaches us about the radical reordering of the kingdom. About the way that value in the economy of God is not measured by wealth or status, but by generosity, by faithfulness, by repentance, by justice. Discipleship invites us to reconsider what we mean when we speak of success. Because Jesus’ definition seems distinctly different from that of the world, or, all too often, that of the Church. So let me leave you with that question: what is success?